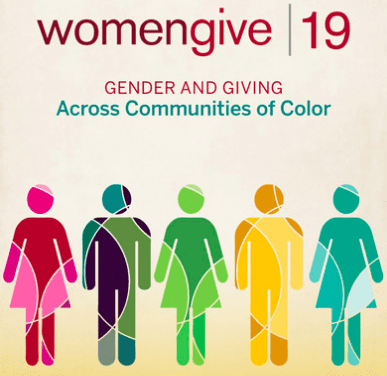 Women Give 2019: Gender and Giving Across Communities of Color studies the way in which race and gender intersect for high net worth givers, as well as givers in the general population. High net worth givers were defined for this study as households with $1 million or more in assets including their primary residence, or households earning $200,000 a year or more in income. The study helps to shed light particularly on women of color and the unique perspectives they often bring to philanthropy. In a video released along with the research, entitled I am a Philanthropist, women of varying ages and backgrounds discuss how they first became givers, and how embracing the label of philanthropist has enriched their lives. The new research also reveals a significant gap between the formal volunteering done by white people and people of color. The study notes that other research suggests that communities of color may do more informal volunteering that is harder to capture with research. Progressive women’s philanthropy has taken a leading role in promoting the social value of inclusiveness. This new research from WPI builds further on the idea of inclusiveness as a cornerstone of successful giving. With large foundations like NoVo Foundation focusing on women and girls of color, and a growing awareness across women’s funds about the need to zero in on this population, WPI’s new research is joining the chorus of thought leaders in philanthropy calling for increased resources and support for racial as well as gender diversity in civil society.